The names of the rikoku incense signify the place names from which they come. 'Rikoku' literally means 'six countries'. Incense is an essential part of chanoyu. Before the host welcomes guests they place incense together with the kindling fire in the brazier or hearth (depending on the season, brazier for warmer months, hearth during the cold months). This is called ‘machikō’ or ‘waiting incense’. The purpose of machiko is to lace the tearoom with an other-wordly aroma, similar to how the aroma of a meditation hall assists meditation practitioners to transcend their egos. 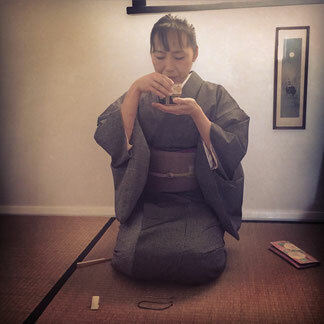 When guests first enter the tearoom, the aroma of the incense is one of the first delights for the senses in chanoyu. The next use of incense in the tea gathering is during the charcoal-laying ceremony (sumidemae). In the brazier months a wooden or lacquer incense container is used in the ceremony. The incense container is an item of high importance to be shared with and viewed by guests. Three pieces of aloeswood are placed in the container for the charcoal-laying ceremony. 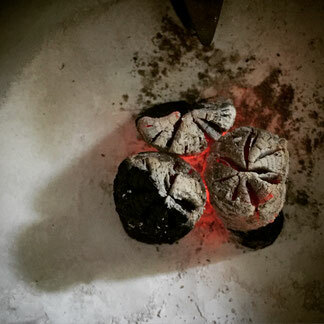 Two pieces are placed in the brazier with the freshly laid charcoal. The incense container is then presented to the guests for viewing with the remaining piece of incense still in the container. The aloeswood does not emit a strong fragrance unless heated, so the guests do not smell the unused piece of incense and instead admire the sappy texture and beauty of the woodgrain as well as view the container that houses the incense. In the hearth months a ceramic incense container is used to carry moist, rolled balls of a mixture of incense powders called 'nerikō'. 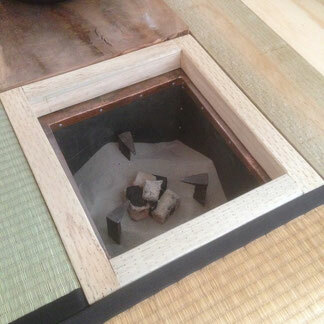 Again, three balls of incense are placed in the container, two balls are placed in the hearth, and the incense container is presented to the guests for viewing with the remaining ball of nerikō still in the container. This time the ball of incense does emit a strong fragrance on its own without being burned, and the guests smell the unused piece of incense when viewing the incense container. 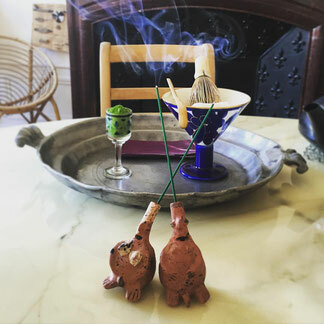 As the incense is placed in the warm ashes (never directly burned on the red charcoals), the fragrance keeps releasing throughout the gathering. 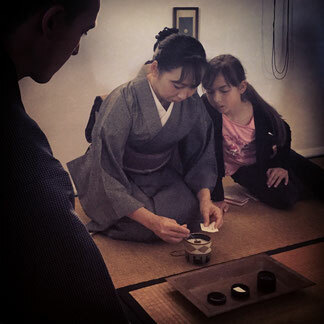 The fragrance of the incense tinges the air of the tearoom all through the thick tea ceremony, and more incense is added if more charcoal is added before the commencement of the thin tea ceremony. In the brazier months for the Ueda Sōko Tradition, upon enquiring the guests are told if the aloeswood is one of the six varieties that make up the ‘rikoku’ aloeswoods. If none of the six varieties of the ‘rikoku’ are being used, the host simply informs the guests: ‘betsu ni gozaimasen’ (not anything significant to mention) and that is that. The host does not explain ‘it is aloeswood’ for the sake of conversation, because the fact that aloeswood is being used is obvious to everyone. This is consistent with the ‘eliminate anything unnecessary’ philosophy of the Ueda Tradition. This being said, there are some nice aloeswoods coming from non-traditional countries. For example, one might use Australian sandalwood or palo santo from South America. In such cases it would surely be a great point of conversation in the tearoom. Kyara is considered to be the incense of highest rank in the Ueda Tradition. This is the most famous and well known of all Aloeswood some believe to come from either Vietnam or Cambodia. Kyara is a particular fragrance described as: "A gentle and dignified smell with a touch of bitterness. The fragrance is like an aristocrat in its elegance and gracefulness." A sharp and pungent smell similar to sandalwood. Its smell is generally bitter, and reminds one of a warrior. Mostly sweet. The presence of sticky oil on a mica plate is often present after smouldering Manaban. The smell is coarse and unrefined, just like that of a peasant. Cool and sour. Good-quality sasora is mistaken for kyara, especially at the beginning. It reminds one of a monk. Sometimes very light and disappearing. Sour at the beginning and end. Sometimes mistaken for Kyara, but with something distasteful and ill-bred about it, like a peasant disguised as a noble. Five scents used to classify aloeswood aromas in ancient Japan. 2. Sour -- Resembles the smell of plums or other acidic foods. 3. Hot -- Resembles the smell of cloves. 4. Salty -- Resemble the smell of the ocean when seaweed is dried on a fire. 5. Bitter -- Resembles the smell of citrus fruits when it is dried over a fire.